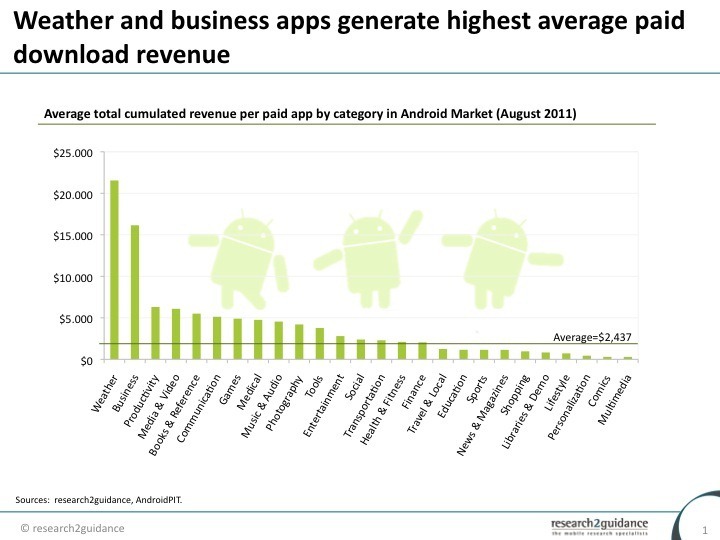 Each month, Research2Guidance puts out a report on Android Market paid apps, which includes how they stack up against each other. The current state of the Market is somewhat of a surprise, as weather and business apps hold the top two grossing spots, with productivity, media & video, and books & reference rounding out the top five. However, one of the most downloaded categories on the Market - games - doesn't show up on the list until number seven, suggesting users would rather download a free game, rather than pay for one. If you're looking to make money on Android, though, R2G suggests focusing on business apps, as it's highly unlikely for anyone to make "yet-another great weather app." For more information, check out the full edition of Android Market Insights, available for free at Research2Guidance's website.